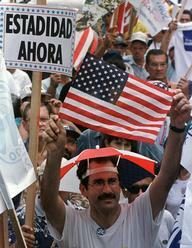 Puerto Ricans go to the polls on Dec. 13 to vote on the island's political relationship with the United States. The plebiscite pits Puerto Rico's pro-statehood governor against groups that defend the island's current “common-wealth” status and groups that favor some form of sovereignty or independence. Statehooders say Puerto Ricans are entitled to the same political rights as other U.S. citizens, but advocates of commonwealth say the current arrangement gives Puerto Ricans economic benefits while protecting their cultural identity. Voters narrowly chose commonwealth over statehood in 1993; polls indicate a close contest again this year. Congress would have to approve any new status, but it has balked at making any changes since Puerto Rico became a commonwealth in 1952.